Are you looking for a USB Interface that supports Toggle Switches but the 2120 just does not have enough inputs? Well, your search is over. The 2235-DP is an exact copy of our popular 2120 board but with a BIG difference; it supports 31 Toggle Switches. Using the LSI 4550 chip, the 2235-DP can be connected into your computer's USB Port and is sensed as a Joystick input, thus making the 2335 compatible with virtually any simulator software that accept joysticks as a digital input. But unlike joysticks that might just have 5 or 6 button inputs; we offer 31, and all produce the standard 1/4 second output pulse. Need more toggle switches? Just add additional 2235 boards to your computer. About 5 years ago, Desktop Aviator introduced our first USB Interface designed exclusively for spring return push buttons. Many years have past without any ungrade to the 2040 USB Interface; not until now. Here we have our 2238-CON USB Interface modeled after the 2040 board, except that the 2238 supports up to 31 push button switches. As seen from the small animated graphic seen below, the 2238 produces a constant output on the USB line for as long as the button is pressed. By removing your finger from the button, the USB output will turn off. Using the standard flight functions seen with FS2002,FS2004, FSX & X-Plane, there are many uses for the 2238. Add the FSUIPC to your sim for many, many more. Are you looking for a USB Interface that supports Toggle Switches but the 2160 just does not have enough inputs? Well, your search is over. The 2237-SP is an exact copy of our popular 2160 board but with a BIG difference; it supports 30 Toggle Switches. Using the LSI 4550 chip, the 2237-SP can be connected into your computer's USB Port and is sensed as a Joystick input, thus making the 2237-SP compatible with virtually any simulator software that accept joysticks as a digital input. But unlike joysticks that might just have 5 or 6 button inputs; we offer 30, and all produce the standard 1/4 second output pulse. Need more toggle switches? Just add additional 2237-SP boards to your computer. The EASY add up to 20 Spring Return Push Button Switches to your Computer's USB Port. NOW with Keyboard Emulator Support. Easily program your 2040 to simulate 20 buttons on your keyboard with this FREE Driver Software. The EASY add up to 10 Toggle Switches to your Computer's USB Port. Each position of the Toggle Switch produces only One 1/4 second Pulse. Can be used with Falcon, X-Plane and any other flight sim function requiring two separate commands to turn a device On and then OFF. The 2160 works GREAT with Mechanical Rotary Switches also. MODEL 2120 The 2120 looks just like our Model 2040 board, but with one BIG Difference. 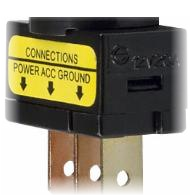 The 2120 has a 1/4 second Pulse Generator for each of its 20 switches built right in. No need to build the H11AA1/2 pulse generator circuit found on our Instruction webpage. What a TIME SAVER! Now connect 20, 40, 60 or EVEN 80 SPST Toggle or Rocker Switches to your Flightdeck; Easily and Inexpensivally with the 2120. The 2120 is compatible with FS2002, FS2004, FSX, X-Plane and FSUIPC flight functions of ALL Aircraft Configurations; From the simple Piper Cub to the more complex Boeing 777 and Airbus A380, Mooney, Piper ect. The 2040 USB Interface performs the same operation as our Model 2040 board (constant ON Output) except the 2045 makes extensive use of our new 3-pin Cables. These cables come in 12 and 20 inch lengths. They can be seen on our PARTS Page. Using the 2045 with the 3-Pin Cables allows for faster, easier assembly. The 2045 can be seen near the bottom of the Page. The 2125 USB Interface performs the same operation as our Model 2120 board (Generates two 1/4 second pulses) except the 2125 makes extensive use of our new 3-pin Cables. These cables come in 12 and 20 inch lengths. They can be seen on our PARTS Page. Using the 2125 with the 3-Pin Cables allows for faster, easier assembly. The 2125 can be seen near the bottom of the Page. The 2165 USB Interface performs the same operation as our Model 2160 board (Generates one 1/4 second pulse) except the 2165 makes extensive use of our new 3-pin Cables. These cables come in 12 and 20 inch lengths. They can be seen on our PARTS Page. 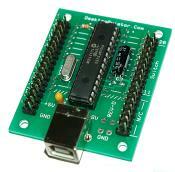 Using the 2165 with the 3-Pin Cables allows for faster, easier assembly. The 2165 can be seen near the bottom of the Page. 3-pin Extension Cable to these terminals, (Red to POWER, Black to GROUND, White to ACC) then just plug the switch into the 2570 (This is a polarity sensitive installation). The Extension Cables can be found on our PARTS Page. Are you looking for a USB Interface that supports the NEW Illuminated Toggle Switches? Introducing our Model 2570. 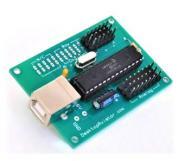 This newly developed Controller supports up to 31 toggle, rocker, paddle ect switches that have a built-in LED. Switches can be purchased with RED, GREEN, Clear, Amber LEDs that light when the switch is thrown into the ON position. Multiple 2570s can be connected to the same computer without any data conflicts. The perfect addition to that Overhead Panel. Many aircraft panels require some sort of 3 way toggle switch (AKA DP3T) to control functions like Air Conditioning (HIGH - OFF - LOW). As you know, 3-Way Toggle switches cost about $15.00USD and that's for min-switches. Standard size costs even more. How about a circuit board that converts a SPDT with Center Off position (and even Rocker Switches), into an ON-ON-ON switch for less then $2.00 for the cost of the switch? That is exactly what the Model 2630 board from DTA does. 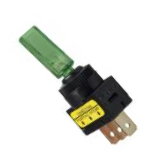 For about $40.00usd (plus the cost of the switches), the 2630 takes the ON-OFF-ON output of any type of Toggle or Rocker switch and converts the 2-way output into the more expensive 3-way. This output can then be easily programmed to any available flight function needing a 3-way switch. Whether you are using Prepar3D, FSX or even X-Plane. The 2630 supports up to 10 SPDT or DPDT switches. And at $15.00 each (for a DP3T switch that's $150.00usd), that's quite a bit of pocket change you can save when using the 2630. Although primarily intended for Flight Simulator software, the keyboard emulator is perfectly suited for all programs that use keyboard shortcuts (hotkeys). For example CAD, graphics, video editing, office suites and many others. Your own keypads can also be easily incorporated. The board has a dynamic keystroke output. It ensures that when turning an encoder knob too fast the missing keystrokes will ne sent even after stopping the rotary motion. If this is undesirable, the keys are output in a constant sequence as long as the encoder is turned. 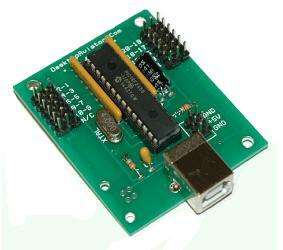 The 2770 is our newest USB Interface. 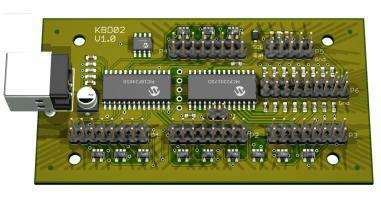 The board supports up to Eight 12 bit Analog inputs and up to 12 Digital. This includes either 6 SPDT Toggle/Rocker Switches or 12 Spring Return Push Buttons or a combination of both switches. 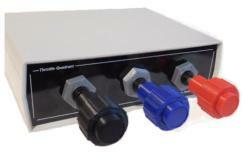 Can also be used with our Cessna Push/Pull Throttle Assemby which will be available soon. Cessna Throttle Quardant w/Plastic Cabinet.